CC Sabathia pitching in an away game. After sweeping the Tampa Bay Rays at Tropicana Field, the Yankees (6-6) will play a four-game series against the 10-2 Detroit Tigers. In the three game sweep of the Rays, the Yankees scored a combined 19 runs while limiting the rays to only seven. Masahiro Tanaka threw by far his best game of the season, Alex Rodriguez hit his third and fourth homers putting him only two behind Willie Mays for fourth on the all-time list and Garrett Jones even hit a triple during Sunday’s win. The bullpen performed well, as they should be able to do for most of the season, and the Yankees will go into Detroit with momentum. Detroit is coming into the series with the the best record in the American League with three more wins than the Boston Red Sox and Baltimore Orioles. The Tigers have scored the second most runs (68), have the second best average (.305), have the third most hits (128) and are in a tie with three teams for the second most doubles (24). Sabathia, Eovaldi and Warren will have to pitch better than they did in their previous starts when they take the mound during this series. The TBD before Tanaka’s name is because their is a possibility that the Joe Girardi will give Tanaka and extra few days of rest. The Yankees talked about going with a six-man rotation during spring training and this is a time that it would make sense to do so. 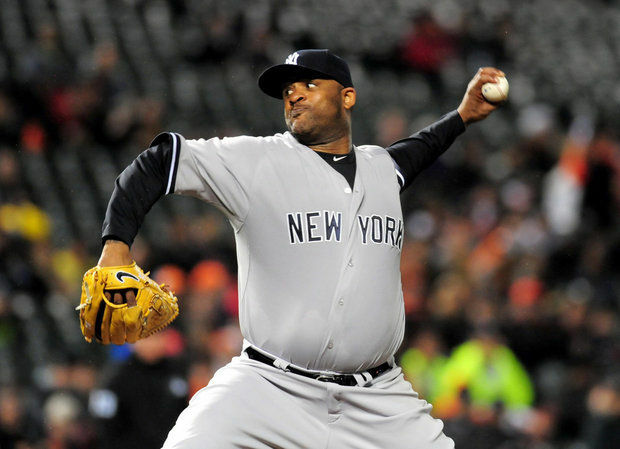 CC Sabathia will get the start tonight for the Yankees. In his previous start he pitched seven innings and allowed seven hits, four earned runs and had seven strikeouts. His previous start was much better than his first one, and Sabathia will look to allow fewer earned runs in his start in Detroit. He has proven to still be a strikeout pitcher with outstanding control as he has 15 strikeouts and only one walk in two starts, but he needs to continue being effective later in games. His fourth strikeout of the game, in the fourth inning against Jonathan Schoop, moved him passed Andy Pettitte on the all-time strikeout list. After the three more strikeouts that he had during the game, he now has 2,452 and is in 36th place on the all-time list. The Yankees will face David Price, who has only allowed one run in 22.1 innings pitched, but they will not have to face Shane Greene in this series. Greene has also been one of the best pitchers in baseball so far as he has made three starts and only allowed one earned run in 23.0 innings pitched. Girardi has decided that Tanaka will make his start on Thursday. It will be the first time this season that Tanaka will start on four days rest. The off days that they have had have allowed him to have an extra day, but Tanaka will have to get used to pitching on four days rest as the season progresses. He will have to prove that he can stay healthy for the whole season.